Every other year I offer one of my favorite and longest-running classes, Pilgrims, Travelers and Tourists—a class which surveys different genres of travel and voyaging historically and cross-culturally. Since travel and movement—questions of who travels, where, why and how—are central to the experience of being a person these days, I find the interesting theories and cases we examine in class to be easy for students to connect to their everyday experiences. Studying something as interesting and exciting as travel—something that is so dependent on the embodied experiences of moving and being in new places—can be frustrating, however, from the classroom. As I often tell my students when we talk about pilgrimage during the first weeks of class, I would love to just fly everyone to St Jean Pied de Port in the French Pyrenees and walk west everyday for over a month until we arrive at Santiago de Compostela. Having discussions about pilgrimage would be much more meaningful if, at the same time we complained about aching muscles, dealt with blisters and sunburn. Taking the class on a month-long trek through northern Spain would no doubt negatively affect their performance in their other classes, but it would be so much easier to study pilgrimage. We could, for example, put Victor Turner’s classic examination of the journey as “liminoid phenomenon” to the test. 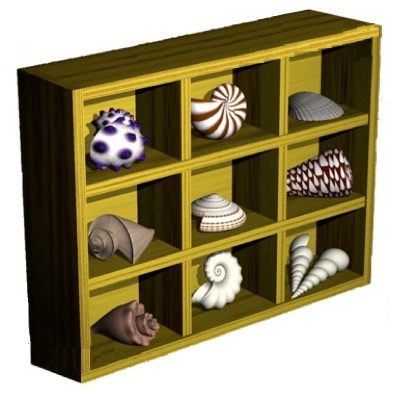 We could examine our symbolic separation from the structures of everyday life, our experience of being “betwixt-and-between” in a new place, and then our returning reaggregation. We would be able to discuss the ways we experience space and time and social relationships differently. We could note symbols and meanings we share and the ones that mark us to others as outside the social structure. While on the journey we could see if we develop a strong sense of communitas. For some time I have wanted to find a way to meaningfully have students experience some of the elements of Turner’s approach to pilgrimage in the university setting, without getting in trouble or having anyone experience too much discomfort. A few years ago, while at the Weisman Art Museum at the University of Minnesota I happened upon a project that has offered my class much of what I wanted. A local artist, Mr. Peter Haakon Thompson, as designed a project called Tent Services, which features “expeditionary conversation tents” made from colorful striped canvas in various sizes. The concept, is for groups to borrow the tents, take them somewhere, set them up, go inside and have conversations. Its brilliant in concept and immediately evokes issues of community, communication, conversation and closeness. It also appeals to us through the associations of the intimate spaces of tents, the colorful exotic of the circus and the warm materiality of wood and canvas. Library entrance becomes a learning space. For the purpose of my class, Mr. Thompson’s tents work perfectly for an application parts of Victor Turner’s explanation of pilgrimage. While they certainly can’t replace the intensely physical nature of some journeys—they offer a physical and symbolic means of marking off space from the everyday, enhancing awareness of bodily experiences and perhaps creating the conditions for a “light” version of communitas through problem solving and sharing an unusual experience. So last week my students went on their own expeditionary conversations around our campus. The hallway connecting the offices of the university president and central administration offices. Breaking the students up into teams, each one received the parts of a tent, an instruction booklet for setting it up, and a packet of activities marked “Confidental” only to be opened once inside the tent. They then struck out across campus to the different sites and set up their tents. Mr. Thompson’s expeditionary conversation tents rely on teamwork to setup and, in the very visible locations in which students were setting them up, the feeling of being noticed doing something out of the ordinary was shared. Moving from being mundane, everyday students to specially noted “travelers” was not without its minor discomforts. 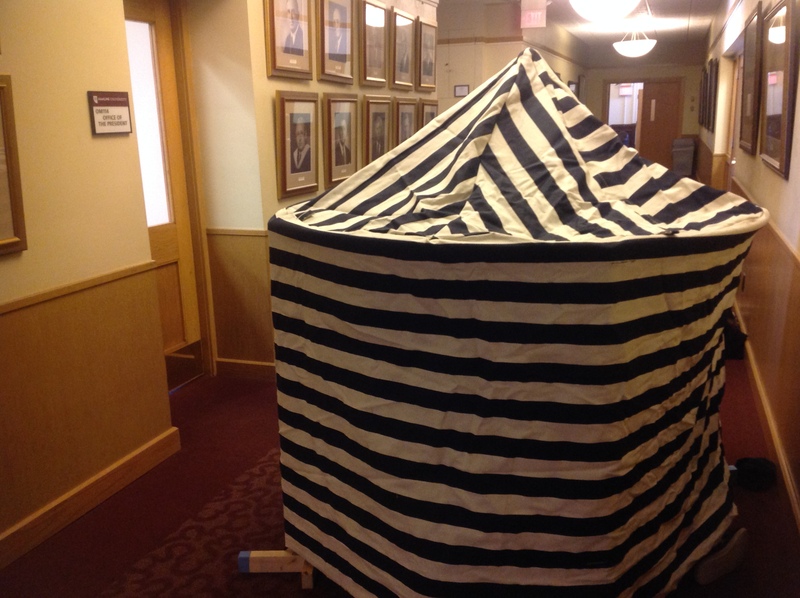 One group felt uncomfortable taking the necessary time and possibly disturbing the office of the university president, so they set their tent up down the hall and then moved it into position only after it was assembled. 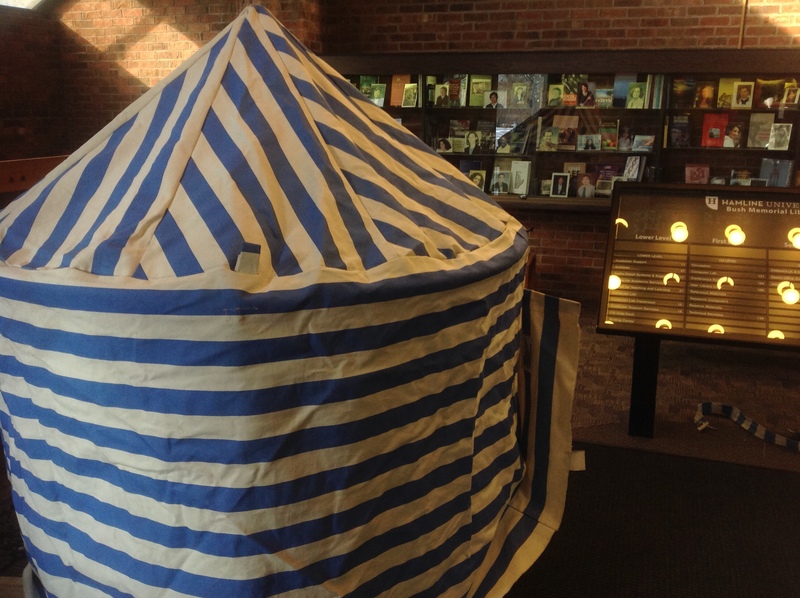 There were concerns with being a “fire hazard”—as if a small, temporary, canvas tent would threaten the lives of library patrons in the event of a disaster. Setting up the tents was an exercise in breaking free from the structural categories of spatial practices. Whenever one plays with structural taken-for-grantedness, there is the possibly of failure. An unforeseen problem or minor injury, for example, would no doubt be “my responsibility.” The last time I tried something experimental with this class I learned just how overly policed campus spaces can be—my students got busted by campus security. 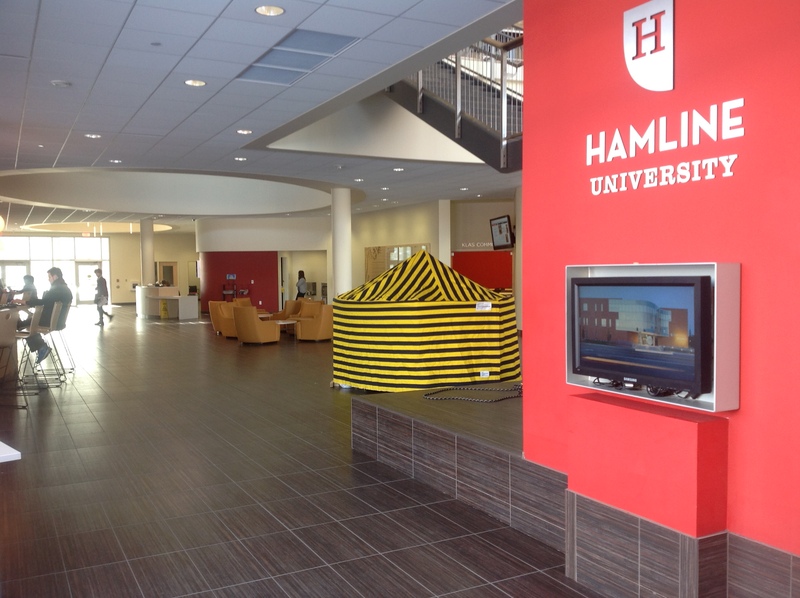 Once set up, the colorful tents claim a special space in the otherwise mundane landscape of the university—physically and symbolically removing it from its practiced use as a hallway, turning it into a learning space. What could be a more anti-structural learning space than the hallway in front of the university president’s office! 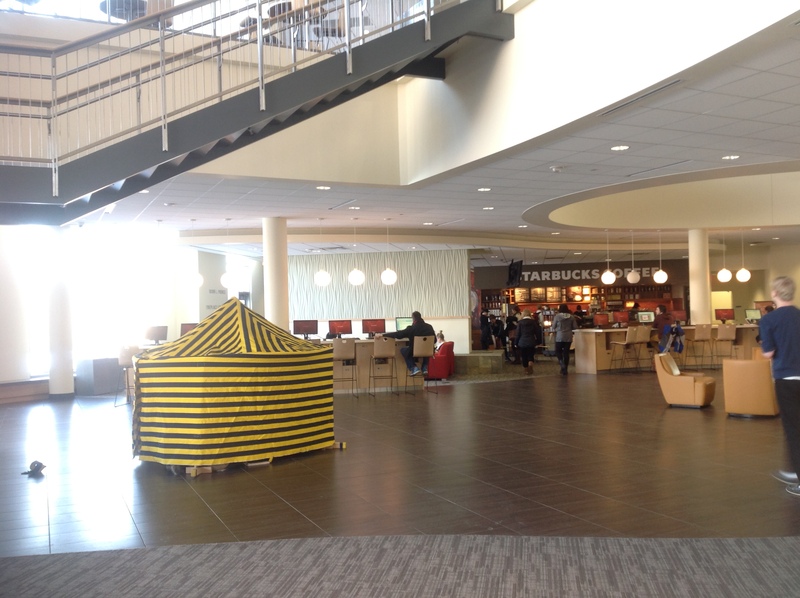 The in-tent experience offered a space just a bit closer than that to which most students might be accustomed—a minor discomfort enhanced by the fact that most of the students are strangers to one another (we have only been in session for a few weeks.) Inside the space of the tent, the air was hotter, more humid, and—in the event someone didn’t brush their teeth or wear deodorant that morning—perhaps a bit smellier. In this way, the tents raised awareness of physical space and bodily experience. Nobody asked about this tent. After settling in the tents, the groups opened the sealed confidential envelopes and followed the instructions. I asked them to select a note-taker and examine the experience of setting up the tent and being inside—in the context of what we have been studying. I instructed them to sit silently and listen to the outside world, to discuss the book we are currently reading, Pilgrim Stories: On and Off the Road to Santiago by Nancy Frey. They were to make notes of any interactions with passersby during the activity. They were instructed to stay in the closed tent for 45 minutes. At the conclusion of the activity students emerged from the tents and disassembled them, returning the hallway and corridor spaces to their original uses. With the collapsed symbolism of the tents no longer available they returned to being ordinary students—with, however, the unique memory of having experienced an anti-structural moment. In our followup class meeting, we had a great conversation about the “in-tents” expereince and tied elements of it directly to discussions we have been having about pilgrimage, liminality and play. The conversation got very animated at times when one group of students reported that administrators gave them gifts of candy and treats (we had talked briefly about gift economies of pilgrimage.) Some students described the discomforts of being in the tent. One other described how he “completely lost track of time” while inside. Most surprising to me, however, was that students in every group reported almost no curiosity on the part of their fellow students as to what they were doing. While administrators and other authority figures on campus were curious about the unconventional use of campus space and “wanted to know what was going on,” only one group reported one student stopping to ask what they were doing. We estimated that hundreds of students walked past the different tents during the time they were up—only one person actually stopped to learn about the activity. We couldn’t be sure if this was an indirect commentary on the curiosity of this generation of students or if the symbolism of the activity, in the contexts in which it was held, somehow sent some kind of unintentional message of exclusivity to passersby. Our conversation began with ways that the “expeditionary conversations” supported Turner’s observations, but by the end they began to point out ways that the model didn’t quite fit—a perfect transition to the critiques of Turner that we will be talking about next week!